Happy Holidays! I hope you enjoyed a lovely time with family, friends and loved ones. Get your bookmark tab ready for the following links, they’re good ones. One of my favorite bloggers, Sarah Von Bargen from yesandyes.org has a business blog, and her link round up is stellar. The next link comes from her most recent post. Social media marketing explained in 61 words. David Meerman Scott is one of my favorite business people. His website is a gold mine of information for marketers. Want to know what your first tweet was? Now you can download all of your tweets. If you’re one of the chosen few, you can get started. I will surely be downloading all of my (almost 50,000) tweets. Ready to make the next big career move, but need to quit your current job? Here is a good guide on how to do that. 4 Steps to Effective Leadership – Would you believe that being a good delegator is on this list? It is, and rightfully so! Delegating tasks to is most definitely a sign of an effective leader. Interesting opinions on Twitter works and how Amber Naslund is using it. I do believe in using lists on Twitter, but I don’t agree with her point about the only reason you should follow someone is to give them access to private message you. Thoughts? Any professional should know these – 25 things young professionals must know before 25. There you have it! Our second edition of the Weekly Round-Up! Anything I should be keeping my eyes open for to share? I read a lot of blogs and find a lot of interesting things on the internet. Starting today, I will dedicate a post each week to the interesting and helpful things I find. The theme will be similar to that of my blog: marketing, communications, PR and social media. I’ll also include links to job boards, if you are on the hunt for your next great move. Arik Hanson shares 13 REAL Chrome extensions community managers will find useful. I file this under “save for future reference”. Very interesting and great information, especially to those managing a brand’s social identities. MIMA is hosting an event on January 16, 2013 called “Iteractive innovation in highly regulated industries”. I’ll be attending this, and it will definitely be an opportunity to network and learn. Lisa Grimm‘s blog is one of the first I followed, and this post hit home. Last Friday, after the horrible scenes in Newtown, CT, the first thing I hated seeing was brands posting about their sales and products. Lisa says it perfectly in her post, How Brands Should Behave on Social Media During a Tragedy. From Yahoo! Finance – The 10 Skills That Will Get You Hired In 2013. With the importance of networking, I was surprised not to see that topic covered. AdFed’s job board is always a great place to look for jobs and internships in the marketing/advertising/creative field. There you have it! The first edition of Leah’s Weekly Round-Up. Are they any great marketing/PR/social media blogs you love and find useful that I should know about? Share in the comments! Today’s Twitter Tip is about using Twitter for events. Twitter can be a very useful social media tool when promoting and executing events. It is also beneficial post-event. 1. Dedicate a blog post to the event: Just do a short write up! Make sure your audience knows what to expect and look forward to at your event. This is also a place to link to the event listing with specific information such as date, time and directions to the venue. 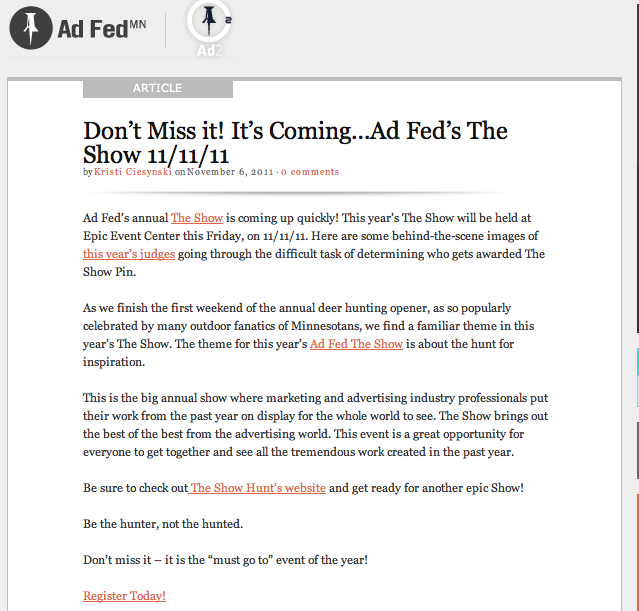 Ad Fed does a great job of having a blog post to create some buzz about their events. 2. 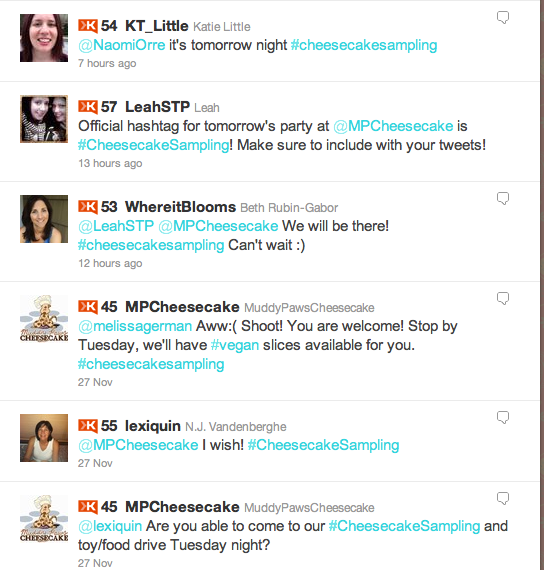 Use an event-specific hashtag: Example: #CheesecakeSampling is the official hashtag for the Muddy Paws Cheesecake Sampling Party! We’ll use this hashtag to have a live tweet wall showing what others are saying. People that aren’t attending can follow along. Post-event, you can put together a recap of all the hashtags in a document. You can make this available to your attendees and others that may be interested. 3. Engage and interact with your audience: Be available to answer questions. If you can’t do this, delegate to someone you trust with the image of your event to do this. Make sure this person knows what they’re doing. These are simple steps that will lead to quality execution of your next event! Do you have any tips or hints to add about using Twitter for events?